Ticking another one off the Pokemon Go shiny list is one of the most satisfying feelings as a Pokemon Go player, because of how hard Pokemon Go shinies are to come by. The odds of catching a Pokemon Go shiny Pokemon are so slim, each one feels like a huge accomplishment even though it's completely random. There are over 150 Pokemon Go shinies to find and catch but since not every Pokemon in Pokemon Go is shiny, you need to know which ones can be. Here's the complete Pokemon Go shiny list as of April 2019. If you've been playing Pokemon Go for a long time and never stumbled across a shiny, don't be surprised. The Pokemon Go shiny odds are roughly 1 in 450. This means that every time you tap on a Pokemon to catch it in Pokemon Go - if it has a shiny version - there is a 1 in 450 chance it will be shiny. However, these odds are dramatically increased on Pokemon Go Community Day to 1 in 25. Community Day happens once a month in Pokemon Go, when a specific Pokemon will flood the streets and appear almost everywhere. Along with the other benefits usually found during Community Day, Pokemon Go shinies become much more popular and you'd have to be considerably unlucky to not find a shiny during Community Day. You won't know if you've found a shiny Pokemon or not until you tap on it and enter the encounter. If the colour change is subtle, you'll also know you've found a shiny if a bunch of sparks fly out from the Pokemon before you throw the first ball. 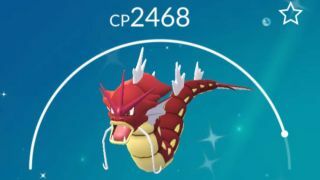 Once you've caught a Pokemon Go shiny, you can search for "shiny" in your list of Pokemon to show you your full Pokemon Go shiny list. All of the Pokemon on our Pokemon Go shiny list below can be found as shinies in Pokemon Go, including how you obtain them all, as some are exclusive to raids or eggs. Currently, all evolutions cannot be caught as shiny - the only exception to this are Pikachu, Nidorina, and Nidoqueen. The Mystery Box is a mechanic unique to owners of Pokemon Let's Go Eevee or Pikachu, where you have to connect your Pokemon Go account to the game. Reckon you've collected every single shiny in Pokemon Go? We don't believe you! But if you truly have, then congratulations, that's as close to completing the game as you can get.